When the dancing began, Governor Charlie Baker was in the thick of it. They fanned out to covered tables, wearing white aprons and carrying plates filled with staples of the annual feast — spoonfuls of sweet potatoes, slices of carved turkey, and, later, pumpkin pie. 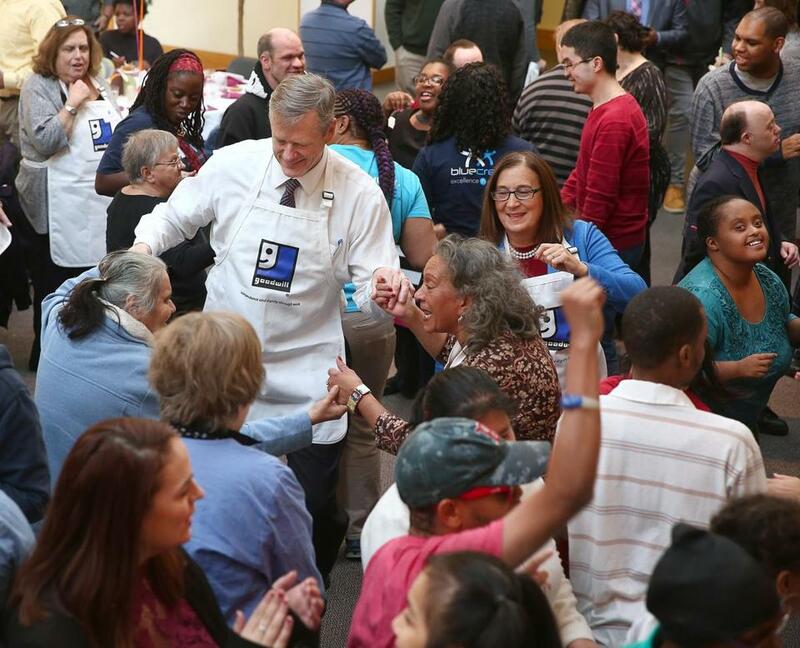 But the Thanksgiving servers were some of the city and state’s most powerful leaders, seeking to provide about 250 workers a treat Wednesday at the Morgan Memorial Goodwill Industries in Roxbury. Attorney General Maura Healey, who served stuffing, said Thanksgiving is about love and compassion. Governor Charlie Baker thanked guests for their hard work across the city and state. After the remarks, people gathered near the live band, dancing to “Brown Eyed Girl” by Van Morrison. Baker twirled a few women around the floor. After eating a slice of pie, Joshua Olson walked around the hall to watch people dance. Olson said he has been working at Goodwill since 2005 and is thankful for what he has learned on the job.